Capturing your family holiday on film is a great way of preserving treasured memories and it will enable you to relive your holiday on those long cold winter’s nights and to share your experiences with your family and friends. Part of the fun of going on holiday occurs before you even leave your house. Shoot scenes of your family waking up and shots of them scurrying around making last minute packing adjustments and, maybe, searching for the tickets and their passports. Obviously, scenes like these can be hilarious but they shouldn’t be contrived so just film what happens naturally at home on the morning of your departure. Airport scenes are fun too if you’re heading off by plane. All holiday destinations will have a unique atmosphere which will vary at different times of the day. For example, filming a bustling resort full of nightlife will be very different at midnight than when filming from the same location at 7am so try to film at different times of the day to capture the full range of moods and atmospheres that sum up your location. Sunrises and sunsets, for example, are both beautiful in their own right but are very different experiences. By filming at different times of the day, you will capture more of a true flavour of what your location is all about. The Effects Of The SunMany people make the mistake of filming where the sun is situated right behind the subjects of the movie. This makes the subjects seem dark and indistinguishable appearing like shadows. You should always film with the sun behind you and not your subjects. In situations where that’s not possible – an example being when your subjects might be on a stage with the lights behind them - some cameras have a backlight function which adjusts the camera exposure so that their faces are clearly visible. 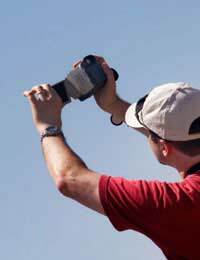 Many home videos look tacky and amateurish because of poor use of the zoom lens. The zoom should always be used smoothly and slowly with a gradual, steady progression. Let’s say for example you’re in a beautiful harbour and have seen a magnificent yacht you want to capture on video. You should start the scene with just a view of the yacht then gradually pan out to show the magnificent setting in which it’s situated. Conversely, say your subject is standing in front of a magnificent palace. Shoot the palace first then gradually zoom in on your subject. Tripods are very useful when shooting zoom shots. You’ll no doubt be seeing and doing many different things on your holiday so you’ll want your film to encapsulate that and not just feature the people on the holiday. Shooting interesting buildings, animals, local markets, the coastline (or other geographical features) interspersed with the members of your party having a good time both outside and indoors will make your video more interesting. Use running commentary for scenes which might not be self-explanatory. All scenes will be familiar to you but others who weren’t there might not get the gist of what you’re trying to portray. Constant running commentary can get boring though so if, for example, you’re filming views from a boat trip you’ve been on where the focus might be on the beautiful scenery, you may choose to edit in some relaxing music later to illustrate its beauty more appropriately. Locally produced music will add to the flavour even more. For example, if you’re in Nashville, in country and western land, you may want to add banjos and pedal steel guitars to your film. Often, some of the best highlights of a holiday arise out of amusing things that have not been planned. They might be funny, slightly embarrassing or just plain stupid but to make sure you don’t miss a thing, always keep your camera close at hand so it can capture those unforeseen moments which can often make a holiday so memorable. Watching a video is no real substitute for the experience of ‘being there’ and remember - an enjoyable romantic stroll on the beach for an hour will seem like a lifetime if the whole of it is captured on video so, when you get back, be very selective in your choice of scenes which will comprise the final edit. As a general rule of thumb – a good holiday video shouldn’t be any longer than 30 minutes, preferably less, so just include the best bits. Don’t Forget You Were There Too! It’s very easy to take on the role of ‘director’ when shooting a holiday video but be prepared to hand over the reins now and again so that you, too, are also included in the film. And, if you want some scenes of all of the travelling party, you can always hand over the camera to someone you’ve met on holiday to shoot a bit of video featuring all of you. After all, you were on the holiday too!